*Has run well on all four starts this season, including second to Blaklion in Aintree's Randox Health Becher Chase in December and when third to Tiger Roll in Glenfarclas Cross Country Chase at the Cheltenham Festival on March 14. *Has lined up in latest two renewals of the Randox Health Grand National - finishing the six-length runner-up to Rule The World in 2016 and 16th last year. *Only once failed to complete the course in 23 starts, when unseating his rider at Kelso in February, 2015. *Joined Kim Bailey's yard in October, 2015, after owners Paul & Clare Rooney moved over 50+ horses from Cheshire trainer Donald McCain and spread them around lots of handlers. Background: Paul Anthony Rooney is originally from London (born July, 1947) and currently spends his time between the Monksford Estate, with its golf course and stables for retired racehorses, at Newtown St Boswells in the Scottish borders and Sussex where he founded the Horsham-based Rooney & Co estate agents in 1981, which he now chairs. Ten years later, when he had 11 offices, he bought the south-eastern region of Prudential Property Services and formed Arun Estates. In 1993 Paul acquired Douglas Allen Spiro in East London and Essex. He moved back to the traditional trading name. Arun now trades under the brands of Ward & Partners, Cubitt & West, Douglas Allen, Pittis (on the Isle of Wight) and Rooney & Co through over 100 branches. Paul's wealth was valued at £142 million in the 2017 Sunday Times Rich List. He decided to start his own estate agency based on his own frustrations when trying to buy a family home in Horsham. He also has a house building business. He and his wife Clare have a number of charitable foundations (the Rooney Foundation being the biggest), which focus mainly on children's disabilities and medical research. Racing interests: Paul and Clare, who were social racegoers, first became involved with racehorse ownership as partners in the Donald McCain-trained Danny Zuko, a four-time winner between 2007 and 2010. They bought a third of Danny Zuko for £4,000 in 2006/07 and then got the bug. They have stepped up their involvement considerably in recent seasons. Initially their horses were trained principally by Donald McCain, although they parted company with the Grand National-winning handler in a well-publicised split in October, 2015, when removing their 50-plus horses from the Cheshire-based trainer. The Rooneys now have their 100+ string spread widely, with their trainers this season including Kim Bailey, Jennie Candlish, Keith Dalgliesh, Gordon Elliott, Johnny Farrelly, Harry Fry, Tom George, Philip Hobbs, Iain Jardine, Alan King, Charlie Longsdon, Graeme McPherson, Neil Mulholland, Fergal O'Brien, Jonjo O'Neill, Ben Pauling, David Pipe, Nicky Richards, Oliver Sherwood, Dan Skelton, Nigel Twiston-Davies and Alistair Whillans. The couple have also enjoyed significant success on the Flat, with the Clive Cox-trained My Dream Boat taking the G1 Prince of Wales's Stakes at Royal Ascot in 2016. Former Jump jockey Jason Maguire is their racing manager. The Rooneys enjoyed their first Cheltenham Festival success with Willoughby Court, trained by Ben Pauling, in the 2017 Ballymore Novices' Hurdle. The Last Samuri finished runner-up in the 2016 Randox Health Grand National. Born: May 25, 1953. Background: Bailey was bred for the Jump game as his father Ken was a successful handler. Bailey currently trains at Thorndale Farm, Andoversford, Gloucestershire, having relocated from his native Northamptonshire in the summer of 2006, after beginning his training career at Old Manor Stables in Upper Lambourn, Berkshire. Following a low-profile riding career, he served as assistant to trainers Humphrey Cottrill, Tim Forster and Fred Rimell before recording his first win as a trainer with Shifting Gold on January 7, 1978, at Sandown in the Anthony Mildmay Chase, a mere six days after taking over the reins from his father. He has trained some top-class jumpers who have rewarded him with training's highest accolades, notably winning the Randox Health Grand National (Mr Frisk, 1990), Timico Cheltenham Gold Cup (Master Oats, 1995) and Unibet Champion Hurdle (Alderbrook, 1995). His highest total of British Jump winners in a season was 86 in 1993/94 before dropping to a low of three in 2007/08. He sent out 61 winners in 2014/2015 and has 44 (up to April 2) this season. Achievements: Bailey is only one of two current trainers to have won the Cheltenham Gold Cup, Champion Hurdle and Grand National. 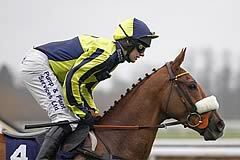 The other is Paul Nicholls. Mr Frisk was ridden to victory at Aintree by Marcus Armytage, the most recent amateur to win the Randox Health Grand National. Mr Frisk's course record of 8m 47.80s still stands today. Bailey has trained four winners in total at the Cheltenham Festival, registering his first victory there for 16 years when Darna won the 2015 Brown Advisory & Merriebelle Stable Plate Handicap Chase. He saddled The Last Sumari to finish second in the 2016 Randox Health Grand National and saddled three consecutive winners of the Betway Bowl Chase at Aintree, Kings Fountain (1992) and Docklands Express (1993 & 1994).